Say you, like many people, excitedly signed up for a recurring $4.99 a month payment to gain access to EA's new subscription service for the Xbox One, only to be underwhelmed by the meager early offerings. There's no easy way out, but there is a shortcut home. I signed up for EA Access earlier today, just to check out how the service worked. At the moment, it works by offering you a free download of Madden 25, FIFA 14, Peggle 2 or Battlefield 4, as well as discounts and early access to upcoming games. Seeing as I own three of the four games offered already, I decided to save myself further $4.99 charges until there were more choices. But where to cancel? It's not anywhere in the EA Access app for the Xbox One. Nor is it in the Subscription settings in the Xbox One menu. Here's the thing. 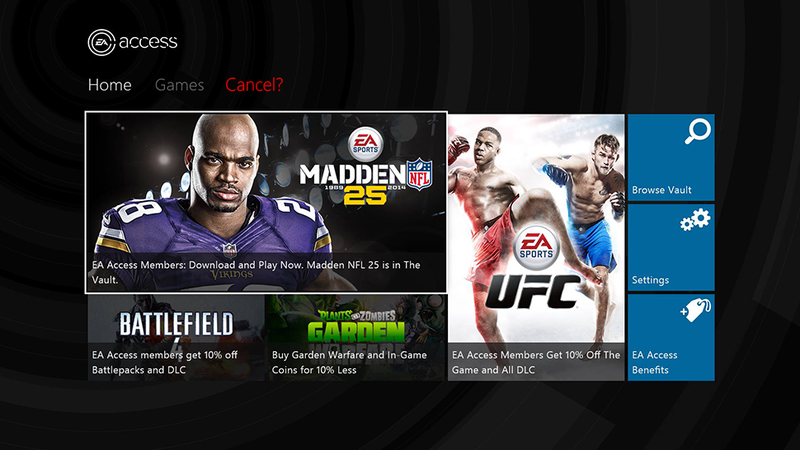 EA Access subscription fees aren't paid to EA — they are paid to Microsoft. And in order to cancel a service you're subscribed to via Microsoft, you've got to go to your Xbox.com Account Page. There, at the very bottom of the subscriptions column in small text, is the link you want. From here you're sent through Microsoft's handy-dandy authentication service once more, which is a joy (yes, text me a code! ), after which you'll finally make it to the page where you can stop paying $4.99 a month. Hopefully you discovered this article in less than the 30 minutes it took me to find the solution. Now to see what happens to that copy of Madden 25 I downloaded once the subscription expires.